Colleen Lynn- Not a dog expert, not a responsible person. 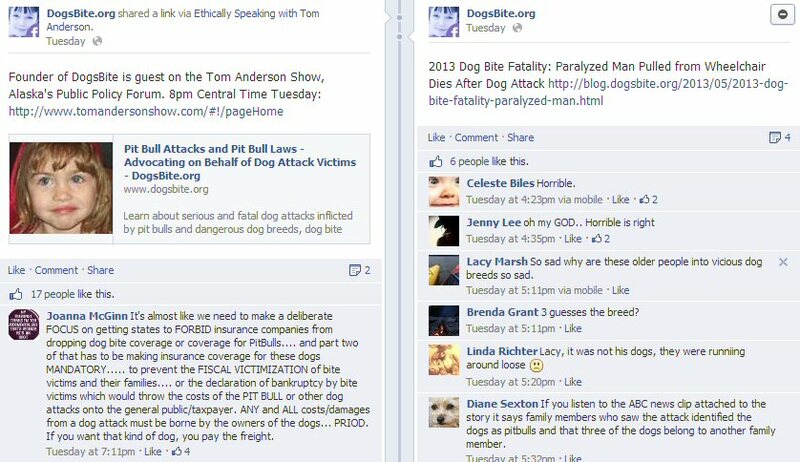 Affiliates herself with known criminals, such as Jon F. Along with known pit haters, who knows nothing of these dogs. What research and data do you collect? The only thing I have seen on your page is selective news articles that you share. You link to pit hating sites that you own and your cult lackey's own. You and your lackey's are not dog experts, the only thing you have right in your about section is the SELECTIVE breeding issue that has been happening with "DOG FIGHTERS". 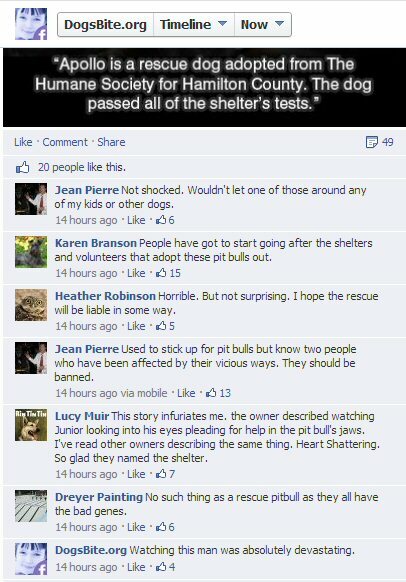 Jean Pierre- you never use to stick up for the pit type dog, you always bashed them in every way you could. Dreyer Painting- I myself know for a fact that there is such a thing as a rescued pit type dog. I have volunteered with my ACO, I have volunteered at shelters, and yes many cannot be saved, many are euthanized due to animal and human aggression, because of these PIT FIGHTERS out there. I own a Staffordshire bull terrier who hasn't bit anyone or any animal yet. He is 3 years of age and has no signs of aggression. He was literally rescued off the streets 3 years ago. So, yes there are such a thing as a Rescued Pit Type Dog out there. Karen Branson- You have one thing right, it is the shelters/behavioral specialists responsibility to do thorough testing on any dog that is adopted out, not the Volunteers. As you can see the owner did nothing to help, didn't break up the fight, didn't use methods of pulling the bigger dog off the little dog. It is the owners fault in this scenario. 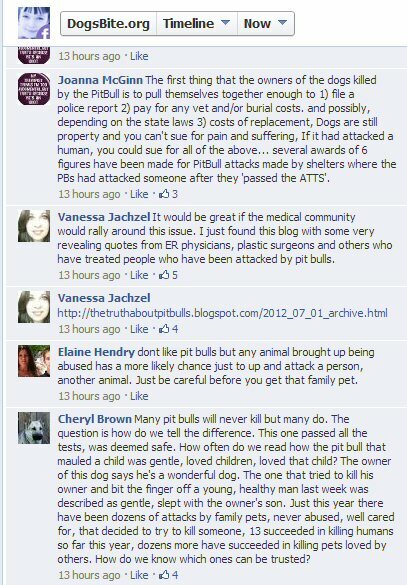 Again with the uneducated statements by the known "Pit Haters". Vanessa- that blog is full of garbage- lies- falsified statements. ER physicians see dog bite victims nearly everyday, and I am going to say it here, a majority of those bites are not by the Pit type dog, but by German Shepherds, Labradors, Rottweilers Collie's, Small dogs and on occasion a Pit Mix. So should we start banning all dogs that bite for the first time? Any dog can bite, however it is up to the owners to take the responsibility for their dogs. News reports- never give out the full details of the event of what has happened, ER only goes by what the Victim of a dog mauling/attack/bite has stated, and even then the DETAILS are not clear enough due to the trauma that they went through. 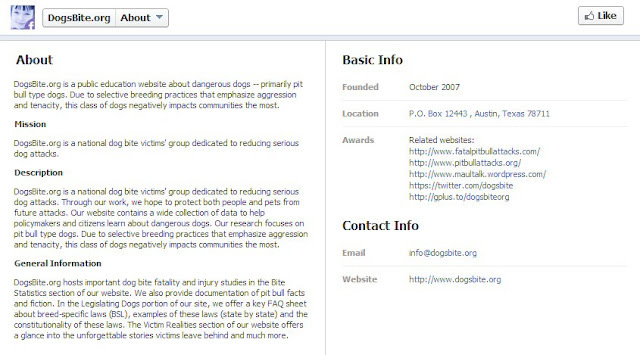 So targeting only Pit Type Dogs while other dogs are in the news, does what now? Feeds into the bad reputation that these dogs are getting, you only pick out the bad side of the stories and not the good. There have been reports out there about Pit type dogs saving people from fires, from drowning, from robbers and other issues. 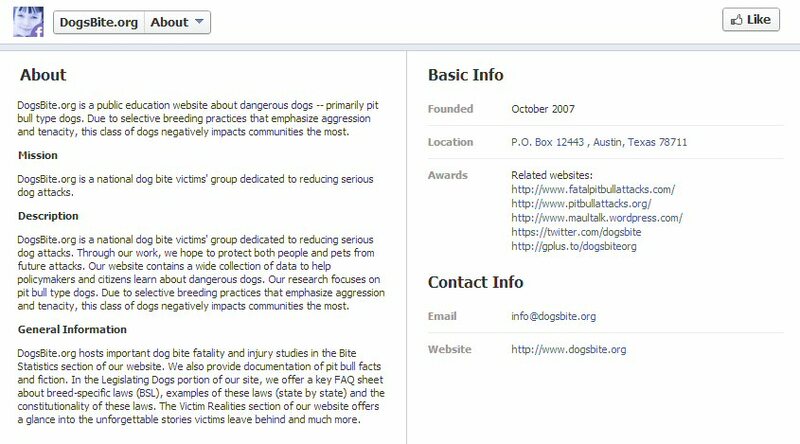 The stories you share are biased, and not all these attacks are by Pit type dogs, more along the lines by MIXES and or dogs who've been used in Pit fighting, selective breeding for the aggressive trait which equals a game fighting dog. There are always signs of aggression in dogs that are not game fighting dogs. Maybe if you had done a little bit of researching you would have known that. You lied and stated that the woman walking the dog moved to the side, she did not. The dog walker was unaware of you, and you Colleen Lynn could have moved across the street, but no instead you spooked the dog and the woman, and this lead to the dog bite. The truth about Colleen Lynn is this: She is nothing more than a web designer social activist. She is not a dog expert, and the more people who follow her instead of researching on their own, the more dogs will be in danger of being put to death because of her FLAWED statistic system. Pit type dogs might be on the radar now, but when they aren't anymore, she will go onto the next target. Just like the BSL.